It was another day of my childhood. I ran out of the door of our compound into what seemed like a never-ending grassland. I'd heard my cousin ringing his cycle bell. As I came out, he called me from the street a little far away. "Today, I'll ride my cycle on the road," he shouted, waving at me, "And not on the grass... Too many trees there for a good ride. And the grass hampers speed. You'll know when you learn cycling." The cousin would speak like an expert. "All you have to do right now is to watch me speed up. I'll show you the dust I'm gonna raise. Like a car." As he rode past, I saw some dust trailing the wheels and I shouted, "Dust. That's like a real car." I would step into an endless grove from the compound of my home. It was a vast orchard.With the dense tree cover--apple, pear, almond, walnut, peach--it seemed that even the sunlight would fail to penetrate and touch the ground. At a distant spot, a brick house could be seen through the gaps between the barks of the trees. And its tin roof was visible through gaps between the leaves. It was the only dwelling to meet the eyes. But unfortunately it belonged to the guard. He was the one person who stood between us and the tempting fruits. But the source of the greatest fear was a two-storey mud-house just inside the orchard. The children believed that it was haunted. There was a ghost, who lived there and came out only at night. There was another view of this setting, a different scene altogether. And that was from our rooftop. You could see all tree tops close together, spread out like a green carpet on a vast area bound only on the far edge by tall, slender trees, and dotted in between by the graceful chinars. The chinars formed an endless line, which was actually the shore of the world famous signature of this city of Srinagar, the Dal. Through the line of those trees, at some spots, you could see the silver shine--the serene waters of the Dal, shining under the sun. At some spots, you could see the colour of the wood of the house-boats. 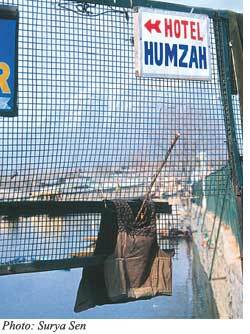 At times you could also spot the shrine of Hazratbal. Further still, beyond the boulevard, the small mountain ranges backed by the mighty Himalaya would kiss the bright blue sky from the top, forming, in a perfect compliment, a horizon straight from a classical painting. But that was quite a long time ago in the middle of the 1980s. I am much older now. But more than myself, my dwelling wears a worn out, heaving look. The orchard is no longer there. It was partitioned some years back. Partitioned endlessly. Barbed wires in every direction came up to demar-cate each individual property that was sold. The trees were chopped down one by one. Now the sun shone as if to poke fun at the bare ground below. For nearly two decades, my neighbours were a million trees. Now buildings have sprouted at every other step. Then there are these lanes and bylanes with walls high and ugly--a legacy of these violent years. And the grassy paths that once existed have turned into dusty tracks. Talk about that other view, from the top. The green blanket has been replaced by a canopy of tinned roofs--coloured, patchy, somewhat rusty and hideous. The Dal Lake might still be there somewhere. Today as I step out of the door of my compound, I see a huge wall right in front, like a slap on my face. Behind me, the small garden seems like a piece of heaven. Still, I walk towards the street outside. I see a car at a distance speeding towards me. As it passes, I lose my sight in the thick cloud of dust trailing it, and I close my eyes. I hold my breath, cover my face with my palms and turn around. I clear the lump in my throat and get back inside to heave a sigh. In my little piece of heaven left over, I quietly sit.